The 1993 Cow Glide Harley For Sale is a low mileage motorcycle! Just under 4k total miles on this amazing bike! The Moo Glide is a one owner bike! Cow Glides and then give me a call. One owner, low miles, great color scheme on a collectible bike! 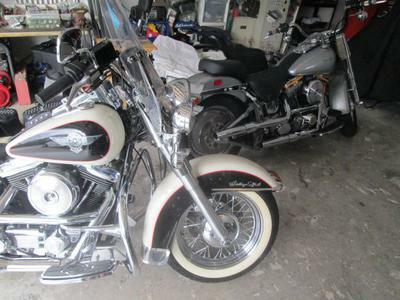 The sought after Moo Glide Softail is in FL. This 1993 Harley Softail Heritage FLSTN Nostalgia Moo-Glide is a sight to behold and a great addition to any collection. Call me, Frank, at 941-423-0eight89, mention GoGoCycles Used Motorcycles for Sale and let's talk!